On June 19, longtime Foundation partner, Frances Westley, and the Waterloo Institute for Social Innovation and Resilience (WISIR) published the Social Innovation Lab Guide. It was produced with support from the Rockefeller Foundation and the J.W. McConnell Family Foundation, with input from leading experts on social innovation around the world. It includes a prologue by Joeri van den Steenhoven, director of the MaRS Solutions Lab, which ran two prototype labs to test and refine the model. Social innovation principles are now embedded in all Foundation activities, testimony to the importance of this approach in tackling complex social problems. 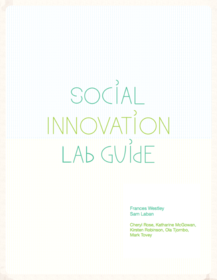 Click here to download the Social Innovation Lab Guide. The McConnell Foundation is located on the traditional territory of the Kanien’kehá:ka (Mohawk), a place which has long served as a site of meeting and exchange among various nations.